A report received in early December noted stable activity during June through August 1997. The same report also described a new seismic system and some initial tremor and seismic data. The Department of Humanitarian Affairs of the United Nations sponsored a project that began in August 1997; this enabled scientists to study Callaqui under the auspices of the Observatorio Volcanológico de Los Andes del Sur (OVDAS) of SERNAGEOMIN and the Oficina Nacional de Emergencia del Ministerio del Interior. The new seismic system includes a vertical-axis, 1-second-period geophone, a digitizer, and a computer. Upon collection, signals are telemetered and processesed by OVDAS in Temuco. During August-October the tremor had characteristic frequency ranges from 0.9-1.6 Hz. For August-October the number of daily earthquakes averaged 0.96, 0.26, and 0.53 events/day. Seismic-amplitude averages (RSAM values) during the 3 months remained stable at 2.5. Based on a pilot observation and analysis of satellite imagery, the Buenos Aires VAAC reported that an ash plume from Callaqui drifted NE on 22 January. The VAAC also reported that an ash plume from Nevados de Chillán, a nearby volcano 120 km N, drifted SE on 21 and 22 January. A small phreatic ash emission from its summit was observed in October 1980. Reference. Moreno, H., 1985, Personal communication. Steam jets from that rose 300-400 m from fumaroles on the SE flank, 200 m below the summit, were observed during dry weather at about noon on 9 and 16 March. Information Contacts: J. Naranjo, SERNAGEOMIN, Santiago; H. Moreno, Univ de Chile. A late-March overflight made after a prolonged dry season enabled views of Callaqui with relatively low snow levels. At the time of the overflight, the main vent at the summit showed vigorous steam emissions and sulfur deposits were noted around the two main fumarolic vents. Similar levels of fumarolic activity were noted over the preceding three weeks. 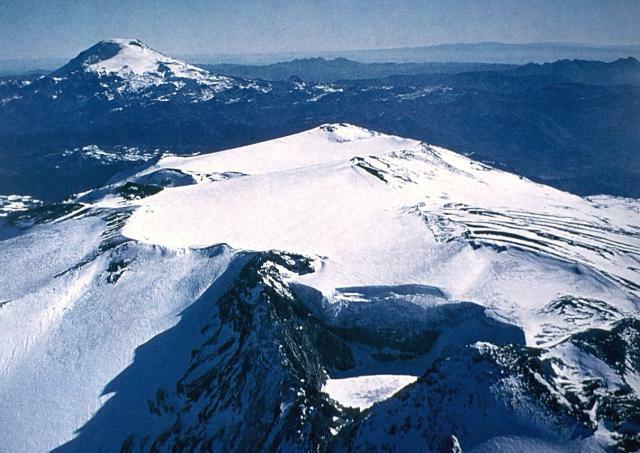 Both the south side of the summit and the uppermost southern flank, at the head of the glaciers feeding the Río Malla, had continuous fumarolic activity. Rocks in these areas were highly altered. Emissions from the southern flank were more diffuse. The late-Pleistocene to Holocene Callaqui stratovolcano has a profile of an overturned canoe, due to its construction along an 11-km-long, SW-NE fissure above a 1.2-0.3 million year old Pleistocene edifice. 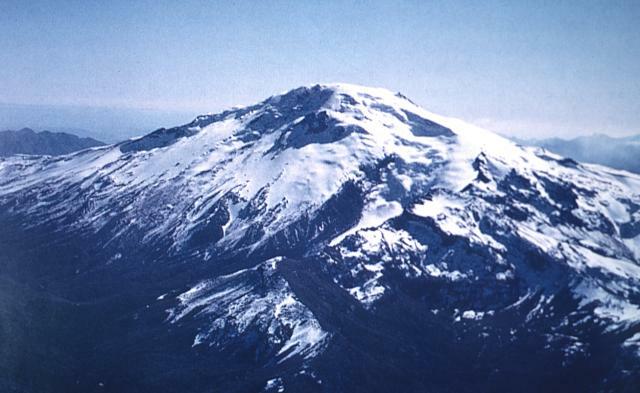 The ice-capped, basaltic-andesite volcano contains well-preserved cones and lava flows, which have traveled up to 14 km. Small craters 100-500 m in diameter are primarily found along a fissure extending down the SW flank. Intense solfataric activity occurs at the southern portion of the summit; in 1966 and 1978, red glow was observed in fumarolic areas (Moreno 1985, pers. comm.). Periods of intense fumarolic activity have dominated; few historical eruptions are known. An explosive eruption was reported in 1751, there were uncertain accounts of eruptions in 1864 and 1937, and a small phreatic ash emission was noted in 1980. Moreno H, 1992. Estudio preliminar del riesgo volcanico del area de Ralco. Proyecto Ralco, INGENDESA, Chile, unpublished rpt. Stone J B, Ingerson E, 1934. Some volcanoes of Southern Chile. Amer J Sci, 28: 269-287. There is no Deformation History data available for Callaqui. There is no Emissions History data available for Callaqui. The ice-capped, 3164-m-high Callaqui volcano has an elongated profile due to construction along an 11-km-long, SW-NE-trending fissure. As many as 16 well-preserved volcanic craters, the majority of which are on the SW flank, have erupted along this fissure and produced lava flows that mantle the volcano's flanks. Two large, ice-filled craters are located at the summit, and intense solfataric activity occurs on the southern side. The small snow-free crater at the upper right, above and to the right of the light-colored area just right of the center of this NASA International Space Station image (with north to the upper left) is Trocon volcano. 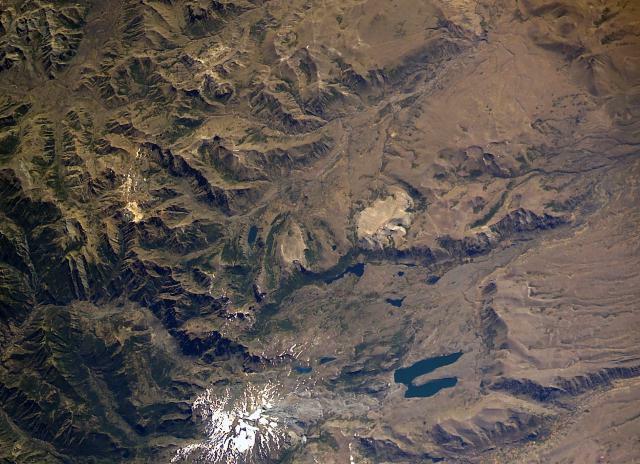 Trocon lies in Argentina NE of the Caldera del Agrio (lower right), whose floor contains several lakes, including the U-shaped one at lower right near the SE caldera wall. Trocon is a lava-dome complex with two summit craters and a pyroclastic cone. Snow-covered Callaqui volcano (bottom left-center) overlies the western rim of Caldera del Agrio. NASA Space Station image ISS006-E-39998, 2003 (http://eol.jsc.nasa.gov/). There are no samples for Callaqui in the Smithsonian's NMNH Department of Mineral Sciences Rock and Ore collection. Large Eruptions of Callaqui Information about large Quaternary eruptions (VEI >= 4) is cataloged in the Large Magnitude Explosive Volcanic Eruptions (LaMEVE) database of the Volcano Global Risk Identification and Analysis Project (VOGRIPA).